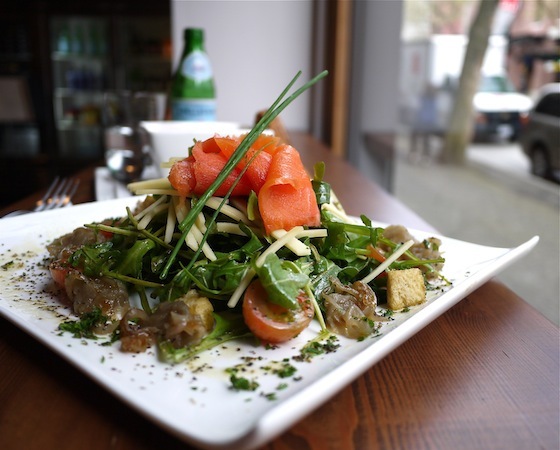 Need a quick lunch spot near Hastings and Cambie? Catch 122 has a big menu and quality food. It’s been about forty days and forty nights and Hastings Street’s new French eatery – Catch 122 – is in full swing. Its sprawling space could very well be a dance hall. With a wooden bar and trendy warehouse-style lighting, the bustling eatery’s daytime vibe easily becomes ‘loungey’ at night. At the kitchen reigns is Walter Messiah – a globe-trotting chef known and respected for his old-school French techniques. A peek at his resume reveals restaurant openings in Monte Carlo, Paris, and Johannesburg (to name a few). When lunch arrived, I could see why the newly opened spot was already so busy. The carefully plated Catch 122 Salad exuded quality and careful execution. With caramelized clusters of room temperature onion surrounding the nice pile of crouton-strewn arugula, it was entirely pleasing to the eye. Sticks of nutty gruyere, vinaigrette doused grape tomatoes and a small portion of super fresh smoked salmon were equally enjoyable – all I could have asked for was more fish.